Evelyn Anite said Otto is a disgrace and needs to be dismissed from the August House. Photo by Beatrice Leni. State Minister for Investment and Privatisation, Evelyn Anite, has accused Aruu County MP, Odonga Otto of having been under the influence of alcohol during yesterday’s fiery Parliament sitting. During the plenary sitting which was expected to consider a motion by Igara West MP, Raphael Magyezi, seeking leave of Parliament to draft a private members’ bill to bring a raft of constitutional amendments, Otto accused Anite of inciting violence by claiming that she has the backing of the army, which is a non-partisan outfit. Otto further said that Anite should be dragged to Parliament’s Rules, Privileges and Discipline committee for putting the lives of some NRM members in danger by displaying to the public names of legislators in the media who support the age limit removal. His revelations sent the House on fire as Anite shot up, to defend herself. 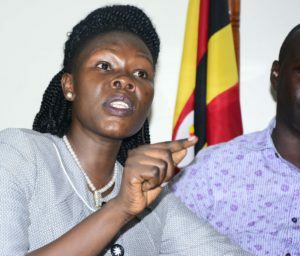 While addressing the media at Parliament today, Anite instead attacked Otto, calling him a disgrace who should be dismissed from the August House. She said the MP was visibly drunk when making the statements. “I wanted to ask the Speaker that we should get an alcohol mouth tester to test the quantity of alcohol in his body. Drunk debating is allowed and is not a sober way of debating in the August House not a sober way,” Anite said. She accused Otto of pulling out a gun and attempting to shoot a civilian years ago, however this matter was not raised on the floor of Parliament. “If someone wants to shoot me like has been sent to me like AIGP Andrew Felix Kawesi, I don’t have a gun like Odonga Otto did against a civilian, but I know my Constitution has mandated people to protect Ugandans and these are the magye. I have no apology for that because the magye is the police and army and this is their constitutional mandate,” Anite said, in defence of her statement last week that sparked criticism. The minister challenged those offended by her statement to go to the courts of law for her utterances. “If I am lying that we have the support of the maggye, let them challenge me that we do not have ten army representative in the house. They were sitting next to me. Odonga Otto is blind and does not see that the members of army reps were seated next to me,” she added. She warned Otto against calling for her suspension, reminding him that it is the people of Koboko municipality and not Aruu who voted her into Parliament. “They sent me here to represent their views for five years. It will not be Otto to say casually that Anite should be dismissed,” she said.